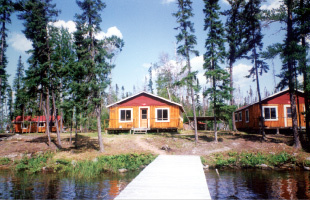 We are the only camp on Mamakwash Lake, with direct access to the exciting Berens River system and Upper Goose Lake. There are approximately 13,065 acres of water to fish and over 30 miles of navigable water ways. Natures ample weed bays, reefs, and islands, provide excellent Walleye and Northern fishing. Our caretaker is readily available to help advise and serve you. He also maintains our five spacious and modern cabins with three piece bath, hot and cold running water. Please call for check-in times.